Goo d morrow to you, dear Reader. I apologize for last week’s absence and the unexpected break from the Six Degrees game! We had family come to town and so we had Spring Break early. Last week, DJ posted about a marvelous sounding tale by George MacDonald. In it, he told us about a shepherd girl named Agnes, who is well-behaved and obedient on the outside, but whose heart is “as black as Rosamund’s only in more deceptive, more pernicious ways. For Agnes is above all conceited, believing that the world will fall to her feet if she will only prove to everyone just how marvelous and admirable she is.” This made me think of another character who at first glance appears beautiful and good on the outside, but is filled with bitterness and hatred and unforgiveness: Annette Burnier, from the delightful story Treasures of the Snow by Patricia St. John. (The same author who wrote Rainbow Garden, which I talked about in a different installment of Six Degrees). 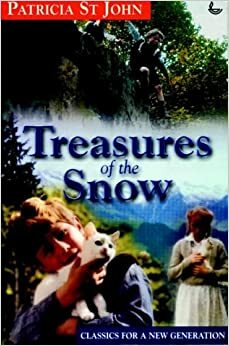 Annette lives in a small village in the Swiss Mountains with her father and her younger brother, Dani. Their mother died when Dani was born and Annette was just eight years old, so she takes it upon herself to raise her brother, becoming like a mother to him. She has classes at home until Dani is old enough for her to return to school, and when she does return to school she is at the top of the class. Their Grandmother comes to stay with them, but she is too old to truly care for children, and mostly just does the cooking and is an adult presence of wisdom in the home. She is a beacon of light and faith throughout the story, and does her best to gently lead Annette and Dani to the Lord. Further up the mountain lives a boy named Lucien who is in Annette’s class at school, but unlike Annette, he struggles with school. He also is resentful and bitter about all the farm work and chores he has to do since his father died. His mother and sister accuse him of being lazy, which does nothing to improve his attitude. He and Annette become rivals of a sort, after he accidentally knocks her sled off the beaten path one day and does not stop to help her. The rivalry escalates, however, when Lucien is the unintentional cause of little Dani having an accident that leaves him crippled. Annette holds Lucien responsible and refuses to forgive him. She becomes bitter and angry and it permeates every aspect of her life, leading her to do something cruel and unkind later in the story. (Which is why I linked her to Agnes, since outwardly she is good at school, dotes on her little brother, obeys her father and grandmother… but she is eaten up inside by anger and is unwilling to forgive). Despite being crippled, Dani is indomitable. He is a sweet boy, and has all the excitement about life you would expect from a five or six year old child who has been extremely loved. His cheerfulness is infectious, and he serves as a bit of a foil to Annette, ready and willing to forgive any offense. Lucien, meanwhile, is eaten by guilt over the accident he caused, and becomes an outcast in the village. One day, he meets an old man who made some bad decisions when he was younger and has also known what it is like to be ostracized. He has allowed his family to believe he is dead, and makes money off his wonderful wood-carvings in the hope that he can someday use the money to help someone in need. The old man sees a bit of himself in Lucien, and takes him under his wing and teaches him the craft of wood-carving, a craft that Lucien excels in. There are a couple of other characters, Annette and Dani’s father, who works hard, loves his children, and wishes he could be home more often and afford to give them a better life. Monsieur Givet a famous orthopaedic surgeon… who comes into the book later. Lucien’s mother and sister, but they don’t get much page time, except to call Lucien lazy and wish he was a better son and brother. If you haven’t read this book, you really need to. It is delightful, and appropriate for all ages. I think I first read it when I was eight or nine, and then I checked it out of the library at least a dozen times before I finally owned a copy. I’m not going to tell you how it all ends, but I will tell you that every single thread gets wrapped up quite neatly and beautifully, the way all good children’s books should. Go! Go forth and read! Remember, you are always more than welcome to jump in and play a round of Six Degrees of Kool Books! All you have to do is pick a character from one of the Six Degrees posts and link that character to a different character in another book. Just make sure you link back to my or DJ’s sites and let us know you are playing so we can come read your post and send others to your blog! More information on how to play and a full list of the posts in the Six Degrees game can be found HERE. I love that you say this book is great for all ages. That’s the best kind of book. It’s also neat that you’ve had such a long relationship with this story. That is another quality of good books, they only grow sweeter with time. Not sure where I’m going to go with this, but I’m sure I’ll thin of something!